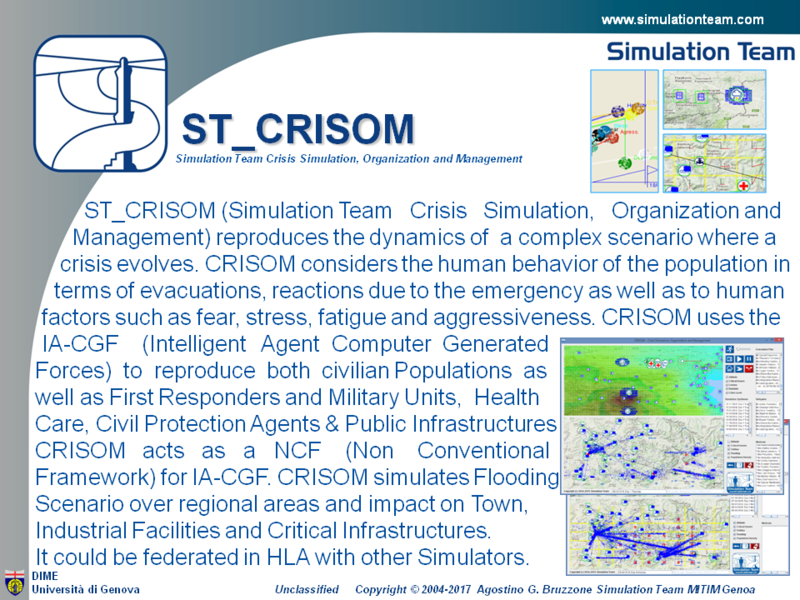 ST_CRISOM (Simulation Team Crisis Simulation, Organization and Management) reproduces the dynamics of a complex scenario where a crisis evolves. CRISOM considers the human behavior of the population in terms of evacuations, reactions due to the emergency as well as to human factors such as fear, stress, fatigue and aggressiveness. CRISOM uses the IA-CGF (Intelligent Agent Computer Generated Forces) to reproduce both civilian Populations as well as First Responders and Military units, Health Care, Civil Protection Agents & Public Infrastructures. CRISOM acts as a NCF (Non Conventional Framework) for IA-CGF and allows to reproduce Flooding Scenario over regional areas and impact on Town, Industrial Facilities and Critical Infrastructures. CRISOM could be federated in HLA with other Simulators.